It's election day! If you're an American and haven't voted yet, GO VOTE! Once you're done, all that's left to do is wait for the results. Between the internet, television, radio, iPhones, iPads, and other devices, there's a countless number of ways to stay up to speed on the results, so iMore is here to narrow down your options for tracking results with your iPhone and iPad. Pulse News is a great way to follow your favorite news sources, in general, and it does not disappoint when it comes to election coverage, either. When adding a news source, Pulse has created categories for election news and election results making it really easy to find the best news for today's Presidential Election. As an app, Pulse News is very well made, has a beautiful UI, and runs like a champ. Of all the apps listed in this article, Pulse News is my favorite, by far. The CNN app has an "Election Center" that includes a section titled "The Elections Report" and another called "Election Results". Both of these sections are great for following today's elections and include news stories, videos, polling results, live electoral college results, and more. You can also set up push notifications to make sure you don't miss out on any of the important news. 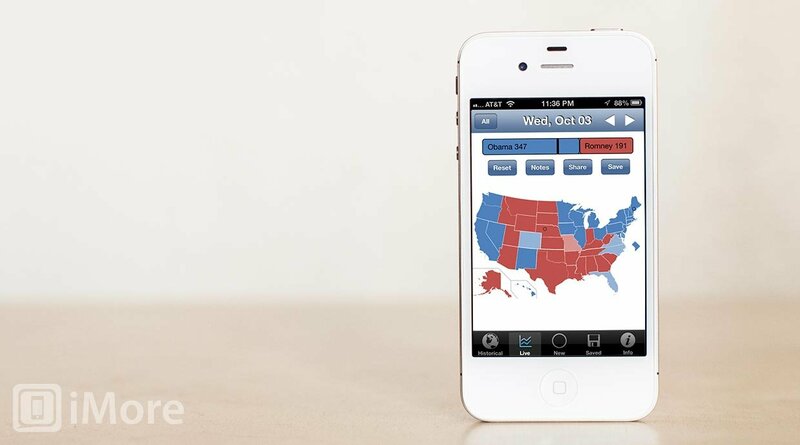 With 2012 Map: The Presidential Election App you can view live maps that are updated daily with the newest polling and election data, “Historical” maps that detail every election, from 1789 through 2008, and a blank map that you can customize from scratch. You can tap states to change their colors or tap and hold to see their details including percentages for each candidate, electoral votes, and previous winners, and share your scenario on Facebook and Twitter. This is just three of the different ways to follow today's election, but what's your favorite way to follow the election? Is it a different app? The television? Your favorite social network? Let us know in the comments below! While you're at it, let us know who you think is going to win!